This post may help you to deal with Java Programs in the EditPlus – a famous editor for many different type of files (for example, .java, .css, .html, .sql, .txt etc). 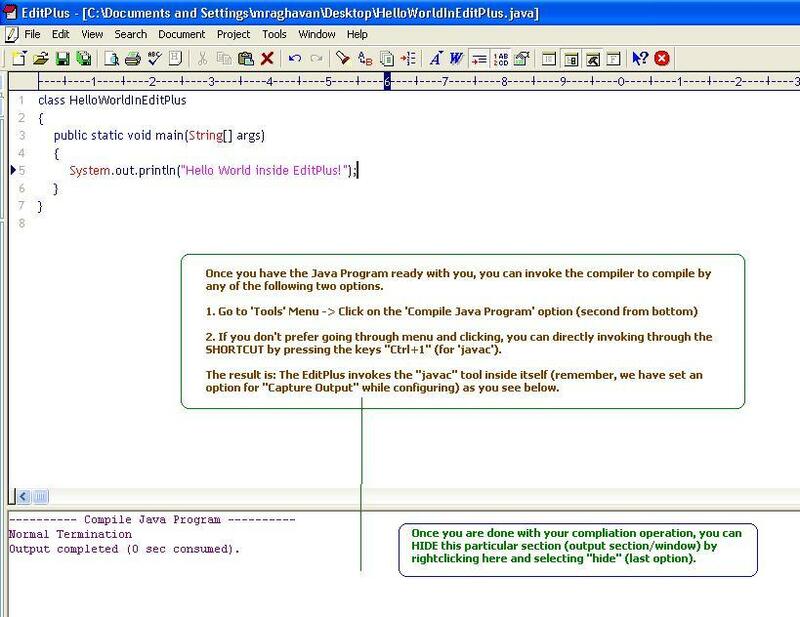 One more similar editor is TextPad, which can directly deal with Java applications as its taking the Java Compiler by default from the installed location in the machine it is running. Thats one advantage with that. What exactly do i mean to say “dealing with Java applications”? Does it mean typing the source code? Absolutely NOT! That does not require any special settings and you can start typing as you would with any other file. I mean to say, “Compiling” and “Running” of Java applications. In EditPlus, we cannot direclty deal with Java Applications and they need some sort of settings to do that. Lets see them one by one. Go to “Tools” Menu -> and click on “Configure User Tools…” option. Click on the individual images to see the full-size screenshots if it does not display the image in full. Every image has the required description and explanation for the step. 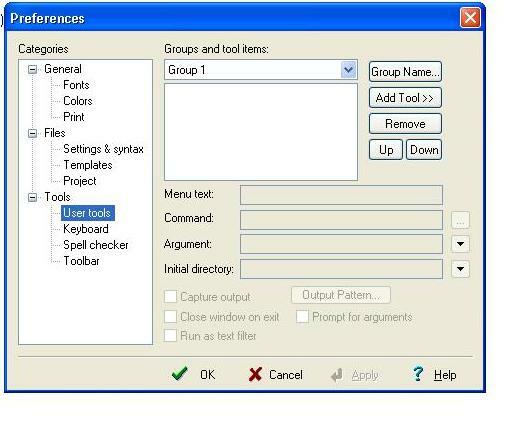 It will open a new dialog box where in you can enter your details to configure for the tools. 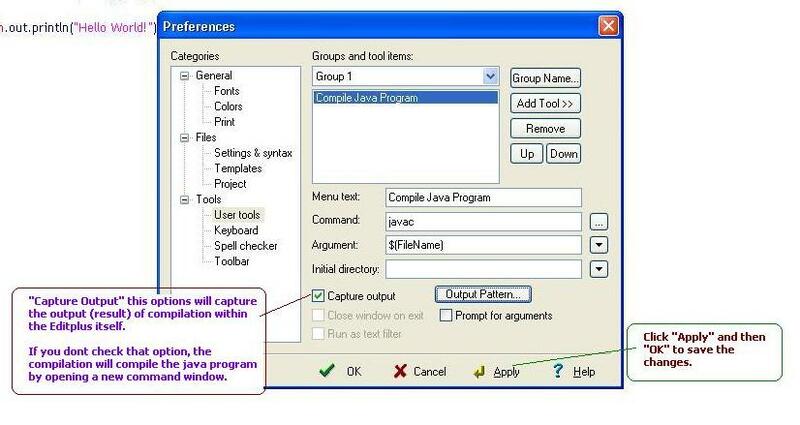 Hope the series of screenshots helped you configure and run a Java Program in EditPlus. I have blogged this steps as i have seen this in one of the threads in JavaRanch. But still, i would suggest you to just proceed with Notepad and the normal Command Window if you are in the beginning stage because the ordinary plain text editor like Notepad will help you improve your language syntax by not having any support for syntax highlighting! It would be so nice if you could please share your feedbacks and suggestions if any for the improvement of the material. Yes there are ways. 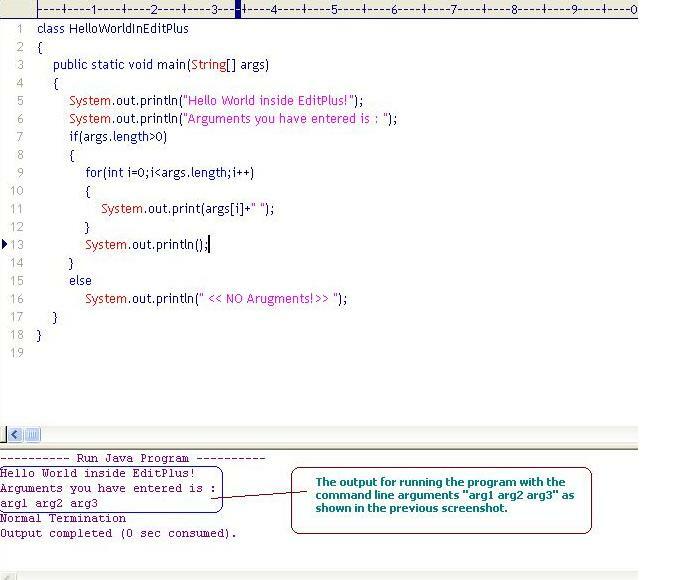 But its possible only in IDEs (Integrated Development Environment) which could get the complete Java Runtime Environment for the program and facilititate the user to debug. 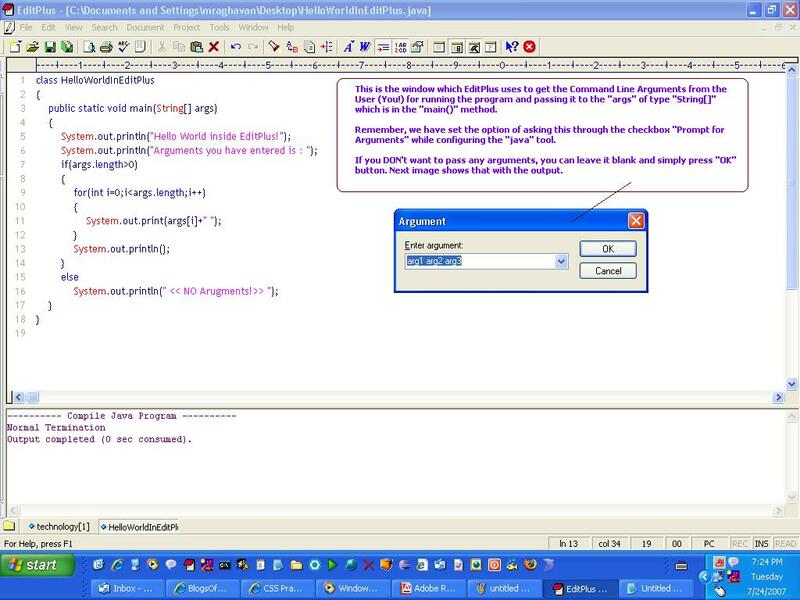 You may please consider using the IDEs like Netbeans, Eclipse etc for the debugging purposes. I have Editplus latest version v 3.0 and it doesnt have any checkbox like “prompt for arguements”.So how should i run my java programs which has invovle values taken from users. Please help me out. here a white space between “$(FileNameNoExt)” and “$(Prompt)” is mandatory. no idea.. i used v2.12.. it should have all.. have u followed the procedures? please let me know how u r doing it? I don’t think you have to do something explicit or special. The same helps you to compile the java classes belonging to user defined packages. Just try doing or let me know how you do it.. so that i can try to help you further! Thanks for dropping and commenting! I have the similar problem as Aparajitha regarding user packages. It was quite well explained . After your replies, i just tried working out. But i could not achieve it directly. Instead i can do it through a work around. I have tried in both EditPlus 2.2 and the latest version 3.3. I am able to compile the classes in user defined packages without any hassles. 2. “” in the “Initial directory:” option. It worked fine. I know this is difficult as you have to keep changing the aforesaid 2 options for every program with a different package structure. I think it works in a very different way. I can’t even compile the classes with and without user defined packages. I have to try a bit more and shall get back to you. Hope this may help atleast to certain extent. There is a way with a bit overhead. Thank you guys! Glad that you found this post to be useful. ouch.. in the prev reply, the option was misinterpreted as part of html tag i guess.. as i had given it inside the angle brackets..
2. “The parent directory of the mypack directory” was given in the “Initial directory:” option. “C:\JavaPgms\Userdefined” in the “Initial directory:” option. The XYZ.jar have to be specified with its location where it is present. Try out and let me know. when i compile prog it giive me error that..
By looking at the error you get at compilation time itself it is evident that your compilation was not successful at all. From which directory you are running your program? It does make sense and with which only the JRE searches for the .class file. Is your class under any specific explicit package? How are you actually executing it? It is all with the path/folder Editplus searches for the .class file. Just check one of the previous comments where i have clearly explained the steps!! you’re getting no classfound because (as Raghs mentioned), java can not find the .class file. In order to get rid of this, when configuring your user tool, in the text box called Initial Directory, ensure that you have “$(FileDir)” for both the compile and run time commands. thanks for maintaining such an informative blog…! well sachin n raghs…… am facing the same problem as suchit………. Welcome here and thank you for the nice words!! This basically comes when the .class file is not being able to be picked up! Can you please check your settings on running the java application? It would be great. If not, send a mail to me with the screenshot of your settings. actually am gettin the same error msg wid command prompt also….!!!!! kindly send a mail with screenshots with settings you have. also give some more details on your directory structure of your programs! @Rafiya… as Raghs has suggested you to check your settings.. You might check this site to find out what he means…. i m getting problems with classes within same package..there r 3 classes “protection”,”derived” n “samepackage” within “package1”. “protection” is declared public,”derived” is subclass of “protection”. problem is “samepackage” cant access “protection” althought i used object of it..
and derived also can not access “protection n i get errer…. Where exactly your .class files are getting stored? That means, which location/directory you are storing the compiled .class files of all these source files? I have java setup with editplus but anytime i try to run code with Scanner in it, it just freezes and i have to close java from the task manager. I can run the code in other apps and it works fine. what am i doing wrong?? Thanks for dropping in and welcome here! I presume you use Java 6.0 with Editplus. To be frank, I have NOT tried it out yet. But I guess there is no proper leverage between the console/terminal and the client (Editplus). Just try it out by using appropriate flush() and/or close() methods. Welcome here and thanks for dropping by! Hey, Thanks for a detailed tutorial. This post of yours was really useful to help me compile and run java pgms in EditPlus. It was all well explained. your tips were very helpful !!!!!!!!!!!! but i am unable to find “prompt for arguments” option in order to run the program using command line arguments where do i find it??????? hey thanks for all the useful info…but i still have an unusual problem….unlike everybody else im getting no errors at all!! !…no matter what i do, i wont get errors…?…. can anyone tell me what the problem is? I have set up the edit plus according to the steps explained above. But it is not compiling and creating my program when I compile it. Please kindly explain me how to set the path to store the .class files. Because when I compile it no class is generating in the source file directory. And when I run the program its giving NoClassDefinationFound exception. Hey Please Ignore my previous post. Now I can compile my java programs and see their output in edit plus itself. glad you find it useful and resolved. Thanks for dropping by! The instructions are well-organised and easy-to-follow. 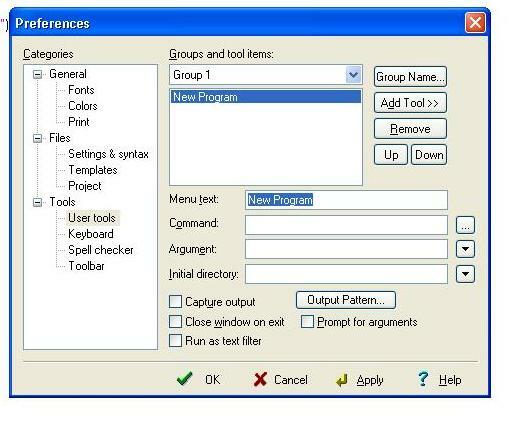 Do u know how to get an output window in editplus when compiling and runnig the code how it is possible to see an output in a separate window for example when we use applet code, or code which requests to enter the text and click the button etc so that we will see these buttons and all program in a separate window. i am getting this error .. can anyone please help me ! I am geting below error while compiling a program. Please help me!!! Output completed (0 sec consumed). If u r getting below error. Please specify the javac & java exe along with the respective executable path. it opening the cmd prompt how to overcome? hi all the techies in this group……i am new to this group and i am new to java language…i am using EDITPLUS 3.0 version ..i follow the instructions as mentioned in this blog …but i am not getting any output………please help me……. Sorry for the delayed reply. You can avoid that by checking on the “Capture output screen”. Thanks for dropping by and welcoming you to the Java world! what exactly you are getting? Can you let me know the error message what gets displayed so that I can try to help you further. 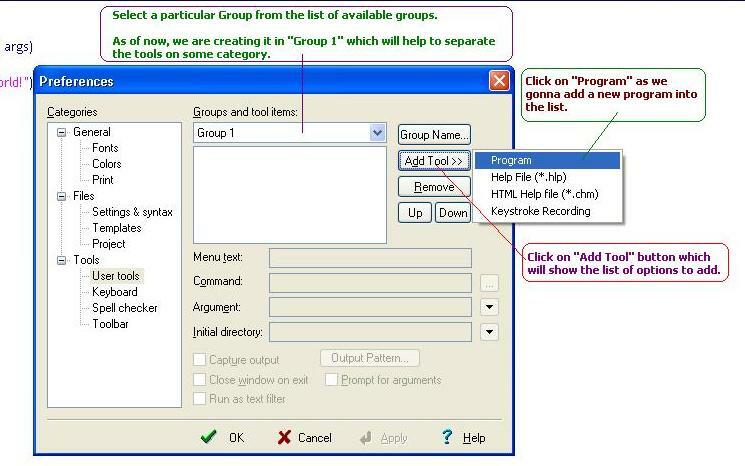 Have you given the initial directory option in the configure user group tool option. hi..how can we pass input to output window in edit plus software for java programs..it is not accepting the input..i mean..i’m unable to pass input from keyboard to java programs..please help me out.. Welcome here and thanks for dropping by. Sorry for the delayed reply. 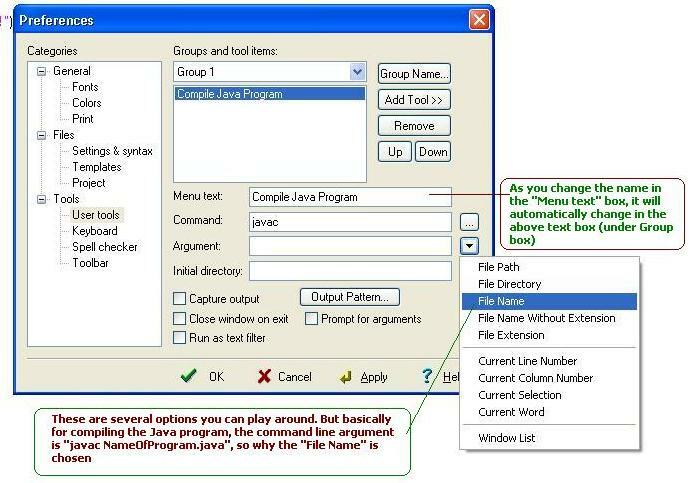 You can pass input from your keyboard provided you had checked in an option “Prompt for Arguments” while configuring Editplus for “Java” — Running your Java programs. Please click on the Image 8 so that you can see it in the full/maximized form. Welcome here. Thanks for dropping by! I have used your steps for compiling and running the program.but I keep getting the message that says “Output completed (0secs)- Cannot run the application”. And also I have Editplus latest version v 3.0 and it doesnt have any checkbox like “prompt for arguements”. I’m really confused and was wondering if you can have my editplus working? I also use the latest editplus. Are you really following the steps I had described earlier? Cannot run the application may be for a different cause. If you try following the steps exactly as what I had mentioned, I am sure you would reach the goal. Good luck and let me know if you need any further help. i am glad to thankful to u .bcoz of tips are helpful me.so i have another doubt . can we run java program without entering arguments? Welcome here and thank you very much for your comments 🙂 Glad that you liked it! Yes of course. we can very well run the programs without any arguments. With the same settings you can run by simply pressing an enter in the window which waits for your argument inputs. Just try it out. otherwise, you can alter the settings so that it does NOT ask any user input. Save the settings and run again. Good luck. Let me know if you face any issues. This means the CLASSPATH is not set. Can you tell me how do you set the classpath ? 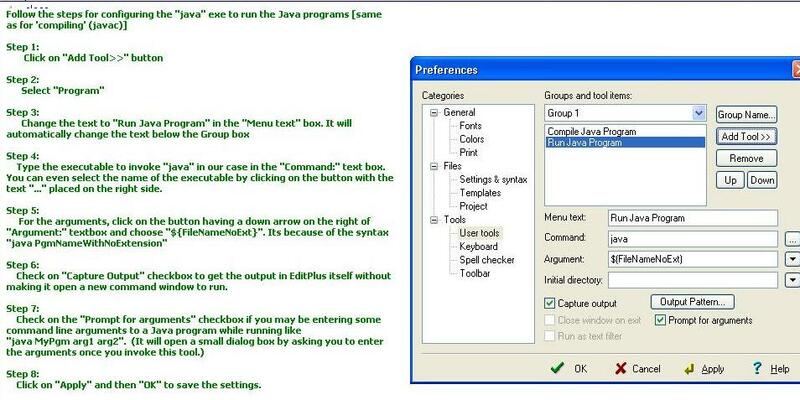 Your post helped me configure EditPlus to run Java programs. But when i run the program cmd is invoked where the output is displayed which i personally find it inconvenient. I would rather like the output to be displayed in Editplus window itself(At the bottom as shown in the tutorial). Pls help me configure..
Hi i was just searching for my queries and i happen to read urs. while am compiling java program………..
i finally got it..but still had one doubt..where to create directory and files…???? Hi ,While iam installing the edit plus in my win7 machine getting the message “some of the files could not be created .please close all application,Reboot windows and restart this instalation” kindly help me on this . looking for a similar subject, your website got here up, it looks great. I was recommended this web site through my cousin. I’m not certain whether this submit is written through him as nobody else understand such specific about my trouble. You are wonderful! Thank you! understanding anything completely, but this paragraph gives nice understanding even. I usually do not leave many remarks, however i did some searching and wound up here how to deal with java programs in EditPlus � BlogsOfRaghs. 😛 And, if you are writing at other social sites, I’d like to keep up with anything fresh you have to post. Would you make a list of all of your community sites like your Facebook page, twitter feed, or linkedin profile? of knowledge, so it’s nice to read this website, and I used to pay a quick visit this website everyday. Thanks for help…………….It is so easy to implement as well as to use. Again thanks a lot……………..
please any one help me out? ?